A more affordable tremolo system. 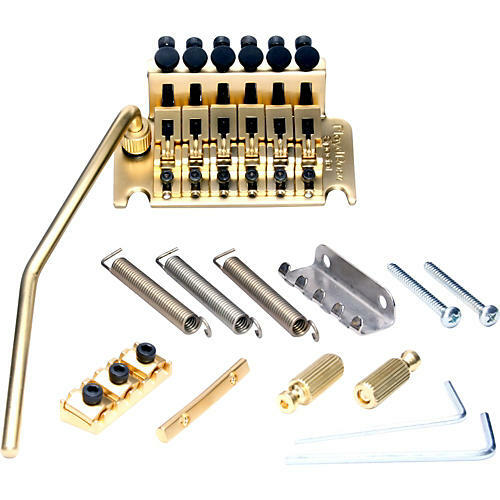 The Floyd Rose Special Series Locking Nut R-3 is an Authentic version of a licensed Floyd Rose tremolo system manufactured in Korea exclusively for Floyd Rose. The Floyd Rose Special maintains the construction parameters and features of an Original Floyd Rose, while utilizing zinc alloy saddles in place of steel and a zinc alloy sustain block in place of brass. The design specifications and high quality materials of the Special Series Floyd Rose bridge will hold up to the demands of today's performers. The R3 Nut is designed for guitars with neck widths of 1-11/16" (42.90mm) and a 10" radius.